Calverts is a design and print co-operative, that specialises in branding, publications and sustainable print and produces high quality literature and web based media for corporate, community, government and arts organisations. A central part of Calverts operations is a commitment to sustainability and it has a proven track record as a ‘green’ printer. In line with this commitment, Calverts are always keen to learn and invest in practices that will make them a more sustainable printer, and to share their learning with their clients and suppliers. Consequently Calverts were interested in London Climate Change Partnership’s business resilience programme and the following was identified from our survey. 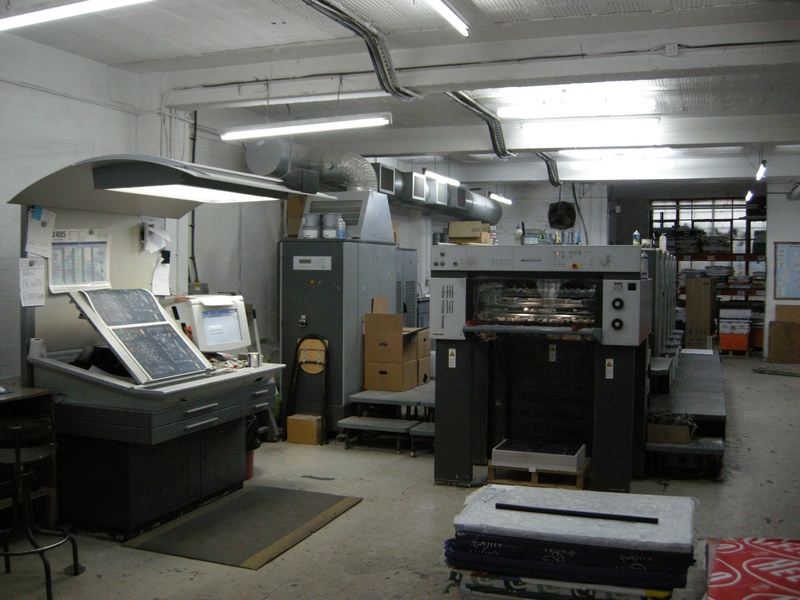 As a printing business, the most valuable equipment on the premises is the printing machinery itself. Due to the size and weight of the main litho machine this has to be stored on the ground floor where there is also a digital press. A second digital press is on the first floor. In terms of their resilience to flooding, electrical sockets and circuits have been raised above flood levels and the ground floor is a concrete floor instead of other flooring (eg. carpet or laminate) that might need replacing. Calverts are aware of the importance of local drainage and avoid any action that could block drains. They also empty oil traps on a regular basis. In the event of an extreme event companies should consider a flexible approach to working from other sites. As mentioned above, due to the size and weight of the printing machinery Calverts would be unable to completely relocate their operations however the design and operations teams have the capacity to work from home (and also live in London). Whilst Calverts can take steps to limit damage and ensure an element of business continuity, another important factor for resilience is insurance. Calverts insurance policy is checked on a regular basis and their policy includes replacing new for old equipment, cover for floods and storms and business continuity insurance. Calverts has 12 members of staff of whom 4 live in the borough where the business resides (Tower Hamlets) so this is helpful if there is a period of extreme weather. There are also protocols in place to keep the office running if this were to happen. Print staff work shifts so there is a degree of flexibility in the event of extreme weather. Accommodation locally can also be provided if required by other workers who live nearby. Calverts have surveyed its staff for any medical conditions in case any member may be affected by extreme temperatures and have also raised awareness of the issue of extreme weather amongst staff. Calverts are aware of the legal obligations of providing suitable workplace conditions – this includes thermal comfort. Calverts staffs are aware of how to turn off water, gas and electricity supplies and would therefore be able to avoid damage in the event of a storm or flood. Due to the cost of heating, production is more expensive in winter. Whilst they are open to the idea of increasing production in the summer, Calverts needs to respond to specific customer demands all year round. Calverts are also undertaking a cross benefit analysis into investing into installing extra thermal insulation in its premises. Due to the impacts of climate change it is expected that heatwaves will become more frequent and severe and this could lead to extra demands (and costs) for cooling. Calvert’s server room is reliant on air conditioning to keep cool and this can be vulnerable in the event of a power cut. There are also air conditioning units in the digital print room and in the design studio. In accordance with their philosophy to reinvest in its business, Calverts has invested in a new and most up to date Reverse Osmosis unit for its main litho press – these machines purify water for use in the printing process. The new unit does not have any waste water whereas the old one did. Calverts expect to make considerable savings from the unit and will be monitoring its monthly water usage to see how this affects its bills. Calverts backs up data on a daily basis on to a secure computer. Vital data is stored off site and could be remotely accessed, enabling operations to continue should the work premises be affected by an extreme event. Importantly, the server room is located on the first floor and therefore above flood levels. Not only does this avoid the damage to essential and expensive equipment, but it also means improves their business continuity during and after an extreme event. Calverts are very aware of the impact that global events can have on their supply network and the price of raw materials: whilst it was not an extreme weather event, the Chilean earthquake of 2010 had an impact upon the supply of pulp and the prices consequently rose. One aspect that did raise a concern for Lee was that their environmentally friendly inks are soya based and their operations are therefore dependent upon the price and security of one raw material. Calverts use a number of different suppliers and are therefore more resilient should supply chains be affected. Although Calverts use soya oil based inks rather than mineral oil based they could still be potentially hazardous. To avoid pollution to the local environment and loss of expensive stock in the event of a flood, inks are stored sealed and where possible on a raised, secure level rather than at ground level. Calverts has implemented an environmental management system to the requirements of ISO14001 to reduce its negative environmental impacts which is certified by NQA, a leading assessment and verification body. They monitor the amount of water, electricity and gas used over the year and have programmes in place with targets and timescales to help reduce their carbon emissions. Calverts are keen to work with their customers to build closer relationships. By sharing their understanding about business continuity, they can help the local business community become more resilient to the impacts of extreme weather and climate change.